After the oil spill, many Black fishermen face an end to their industry and way of life. (FinalCall.com) - While the country celebrates BP's successful effort to finally cap a deepwater well gushing oil into the Gulf, Black fishermen are losing millions in revenue, complain of being deprived of recovery jobs and denied payments made to those affected by the spill and expect to suffer at least five years while trying to bounce back from this environmental nightmare. Mr. Battle, 53, grew in love with fishing as a teenager under the tutelage of his father. He has worked on multiple boats for decades but now is stressing about where his next meal will come from. An investigation led by the NAACP found minority contractors are being overlooked in opportunities to make money assisting in cleaning up the oil. Information from the Federal Procurement Data System showed that out of the $53 million awarded in contracts to clean up the oil spill only $2.2 million (4.8 percent) went to minority-owned businesses. After the civil rights group spent several weeks last month on the ground, NAACP President Ben Jealous sent a letter to BP CEO Tony Hayward. “I emerged from that visit dismayed and outraged by what I heard and saw. Local residents who have lost their livelihoods due to the oil spill are not being hired on to work crews. Instead, contractors engaged by BP to staff clean-up crews are busing in workers from out of state,” wrote Mr. Jealous. According to a report by The Nation magazine, BP has even chosen to hire prison inmates to help with the oil spill versus paying struggling coastal residents. “Workers of color tend to be assigned the most physically difficult, lowest paying jobs, with the most significant exposure to toxins, while White workers tend to be in supervisory, less strenuous positions,” said Mr. Jealous, in his July 9 letter. 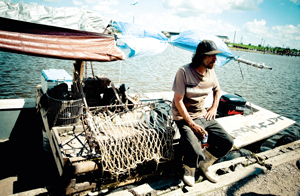 According to Mr. Encalade, at least 25 of 75 boats owned by members of the Louisiana Oysterman Association were hired by BP through the Vessel Opportunity Program. One catch—whatever fishermen earn will be deducted from any future potential settlements. “That's crazy. So that means Black fishermen are basically out there working for free. Personally, we have lost millions and BP has taken this arrogant attitude. I have lost $5,000 a day these last 100 days and some has lost more,” said Mr. Encalade. Before the oil spill occurred, Mr. Encalade said he owned 1,500 acres of active oyster beds. “All of my oyster beds are dead. We have been feeding our families for years through these beds. Many of us have sent our children through college with the money we have earned from those oyster beds. BP would rather spend $50 million on an advertising campaign than pay us what we are owed,” Mr. Encalade. The oyster beds were killed off by fresh water rerouted from the Mississippi River into the bayous to ward off the spread of the oil, said the longtime oysterman. Mr. Bartholomew is president of Fisherman and Concerned Citizens, a group of about 150 members. “It's hard to be optimistic because we have been blocked out. The long-term effect is yet to be seen. We have received a couple of checks to replace a small amount of our lost wages. But it is only enough to get through the day,” he said. A BP official said Aug. 2 that tests to see if mud could be pumped into the blown out well were beginning and plugging the well would start the next day. While July 28 marked the 100th day since BP's Deepwater Horizon drilling rig exploded, killing 11 workers and injuring 17 others, the offshore oil spill is considered the largest environmental disaster in U.S. history. The leak was largely stopped by capping the gushing oil wellhead but leaders and environmental rights advocates fear the worst is yet to come. A federal lawmaker complained that the Coast Guard allowed BP to excessively use chemical dispersants to clean up oil and there is concern about whether the cure may be worse than problems caused by the oil itself. “BP carpet bombed the ocean with these chemicals, and the Coast Guard allowed them to do it,” said Rep. Ed Markey (D-Mass.,), who chairs the House Energy and Environment Committee, in a July 31 statement. “After we discovered how toxic the chemicals really are, they had no business being spread across the Gulf in this manner,” he said. The chemical should only have been used in “rare cases” and with advance approval—which didn't always happen—said the Massachusetts lawmaker. Questions about health hazards to workers also remain. “Workers and residents who live on the coast have reported irritated eyes, nausea, problems breathing, and headaches. Cleanup workers are not being provided with protective clothing and masks, resulting in hospitalizations,” said Mr. Jealous, in his communication with BP. “This will not only be an economic loss of enormous impact but this further exposes the nation's lack of effort to protect marginalized communities from the environmental affects,” Attorney Tracie Washington told The Final Call. Attorney Washington is president of the Louisiana Justice Institute and worried that, coupled with ongoing recovery from Katrina, this spill could be the nail in the coffin for the fishermen's community. “There is a possibility that the African-American fisher's community could become extinct. They don't need just short-term financial supplemental income. They need full justice to avoid being victims of the historical discrimination that has plagued our communities during disasters,” said Attorney Washington. Monique Harden, co-director of Advocates for Environmental Human Rights, expressed the same sentiment to The Final Call. “The Obama administration is continuing down the path of setting up discretionary programs to address major disasters by appointing one person to determine what recovery will be for the people and the environment harmed by the BP oil drilling catastrophe. I have yet to see any action that reverses what Bush did after Katrina,” she said. “Now five years later you still see many of them have not recovered from Katrina. Our communities are the most vulnerable to these disasters,” added Attorney Washington. In late June, Marc Morial led a Gulf Coast fact-finding mission by the Urban League and is fully backing the Black fishermen. The Urban League plans to release its own report on the crisis and had some oystermen participate in its recently ended 100th anniversary convention. “These are second and third generations of fishermen seeing their livelihoods threatened. They need to be compensated quickly,” Mr. Morial told The Final Call. The NAACP wants BP to ensure that workers of color are not relegated to arduous tasks and low-paid positions and wants minorities awarded their fair share of contracts. And, the NAACP wants financial support to go to community-based organizations assisting distressed families. “People truly don't understand how it feels to all of sudden not be able to do something you've been doing all of your life. Our children and grandchildren will be affected by this for years to come. This is what we talk about every day since this spill happened,” said Mr. Battle. “Congresswoman Maxine Waters and Congresswoman Sheila Jackson-Lee have been so gracious in helping us, also the Urban League. Where is President Obama? We support you, now we need you to step up,” said Mr. Encalade, speaking of the president. 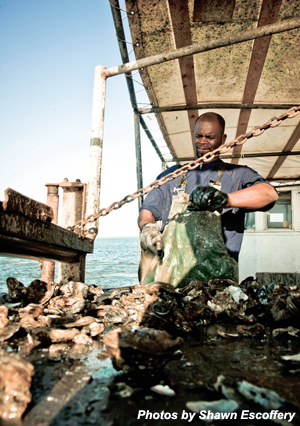 Oystermen want the president to push BP to compensate them for all of their losses. Mr. Encalade spoke at a congressional hearing in May and warned that Black fishermen were already in crisis and called for more pressure on BP on their behalf. Little has been heard from the White House since that appeal was made, he said.